First responders were on the scene of a wreck involving two motorcyclists on Ohio 49 Friday afternoon. GREENVILLE — The Darke County Sheriff’s Office is investigating a motorcycle accident that occurred Friday afternoon. 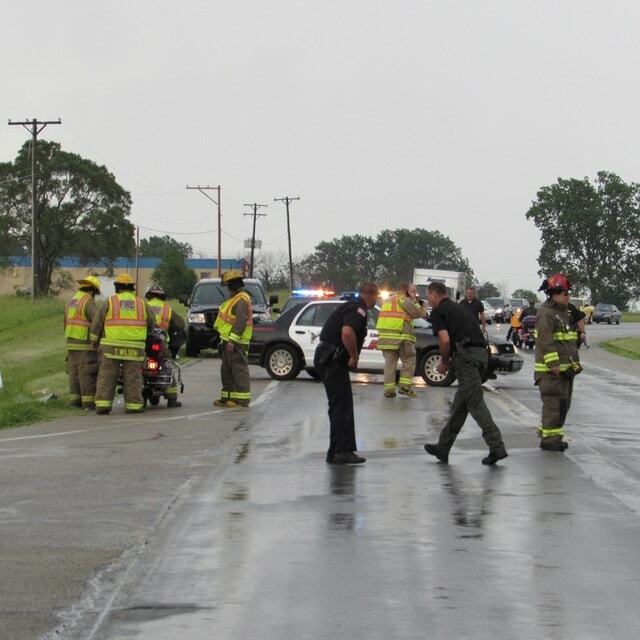 At approximately 12:48 p.m., Darke County deputies along with Greenville Rescue, Greenville City Fire and Greenville Township Fire were dispatched to the crash scene at State Route 49 just south of Greenville. The preliminary investigation of the incident revealed that two motorcyclists were leading a funeral procession when contact was made between their motorcycles. Both were traveling eastbound on State Route 49 at the intersection of Meeker Road. One motorcycle was a 1998 Honda Gold Wing driven by Mark A. Miller Sr. of Lima. The second motorcycle was a 1992 Harley Davidson driven by Charles E. Miller of Ansonia. A female passenger was riding with Charles Miller at the time of the accident. Mark Miller was treated at the scene and released. Charles Miller and his passenger were transported to Wayne HealthCare where they were treated and released. The accident continues to remain under investigation.